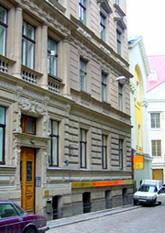 Welcome Inn is an all suites inn which is delightfully located in the heart of Old Town, Riga Latvia. It nests its premises in and among the historical old buildings at the best location of Old Riga, with only a few steps away from the Opera House, trendy restaurants, and boutiques. Welcome Inn shares the same floor with Mystic Cafe where you can enjoy meeting our female members who look for their soul mate. Drink a cup of coffee or tea with them. Welcome Inn provides daily maid services to all suites. Laundry and press service is also available. Mystic Cafe office is open 7 days a week and the friendly staff are always ready to help you for whatever you need to make your stay in Riga, Latvia comfortable and convenient. This large deluxe two-room (large one bedroom) suite includes full bathroom with bath tab & shower, kitchenette, international cable TV, telephone, DSL internet, two sofas & big easy chair, high ceiling with original ornaments, and chandeliers. This large two-room (extra large one bedroom) apartment suite includes full bathroom with bath tab & shower, separate full gourmet kitchen, international cable TV, telephone, leather couch, arcade video game, high ceiling with large windows through that direct sun light shines through. It is located only a few block away from Mystic Cafe. This deluxe jr. suite has a full bathroom with bath tab & shower, kitchenette, international cable TV, reading desk with telephone, separate walk-in closet with a window, and its own separate entrance. Great for business travelers.